Tim Thornbury has been named as the full time city manager of Red Bank, after having the job of Interim city manager for the past several months. Mayor John Roberts said when he became mayor eight years ago, he looked around and evaluated all aspects of the city and determined that cleaning up the city was needed, and putting the right people in the right positions became a priority. 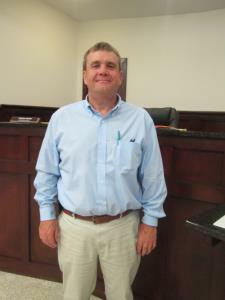 Mr. Thornbury was given the job of overseeing the public works department in 2011. That department is responsible for 80 percent of the city’s entire yearly budget. Since he was charged with overseeing improvements in the neighborhoods, property values have increased by 25 percent because Red Bank has been cleaned up, said the mayor. Mr. Thornbury has lived in the city all his life and knows a lot about it, continued Mayor Roberts, and he is the most logical choice to fill the position. The vote to approve Mr. Thornbury as city manager was unanimous. Continuing the effort to promote commercial development while protecting existing neighborhoods, the commissioners approved the creation of a third commercial designation, C-3 commercial. Already existing is C-1 on the south end of Red Bank and C-2, the central business district. The new C-3 commercial district is on the north end of town, where a lower intensity form of commercial development will be promoted, such as drug stores, bakeries, florists and beauty shops among many other businesses that will be allowed by amending the permitted and prohibited uses within the zone. Improvements will also continue in the other commercial zones. At the commission meeting Tuesday night an ordinance passed to modify the set back requirements in the commercial zoning districts in order to correspond to provisions that are in the design review ordinance. Another change to the zoning ordinance is regulation of where businesses can have outdoor displays, storage and sell merchandise in the commercial zones. A zoning change was also approved for 1.3 acres of residential property at 918 Lullwater Road. The zoning was changed from R-1 residential to R-T/Z residential townhouse/zero lot line zone. The owner/developer plans to build six 1,500-1,800-square-foot single-family homesl. The plan previously received approval from the planning commission. All the zoning changes that were passed Tuesday night will require a second and final reading on Nov. 20, to become law. City Manager Thornbury reported on a bond of $478,000, a four-year loan that will pay for paving secondary roads and buying a commercial mower, which were both included in the 2018-2019 budget. The city was authorized to apply for a grant of $2,500 from the Tennessee Municipal League matching grant program. If received it will require an equal match from Red Bank and will be used toward purchasing security cameras for the new city hall building that is currently under construction on Dayton Boulevard. Taxes will now be collected on short term rentals in Red Bank. The city has entered into an Interlocal agreement with the Hamilton County trustee to collect the hotel, motel and short term residential rental occupancy tax for units operating such as Airbnb and VRBO. Of the four percent tax, the county will keep one percent. The board of commissioners earlier gave the police department approval to buy surplus property from the Department of Defense. Tuesday night they authorized the chief of police and mayor to sign a release of liability, required by the state of Tennessee, relating to these purchases. Property that has accumulated in Red Bank from seizures, found or unclaimed items was declared surplus and will be sold on govdeals.com. Businesses that sell alcohol must be recertified every two years by state law. UMA Partnership has been in operation at 3603 Dayton Blvd. Suite C. Police Chief Robert Simpson has reaffirmed background checks for the owners and found no violations in sales. The mayor was given approval to sign a certificate of compliance so the store can continue to operate.